Manchester United manager Sir Alex Ferguson praised Wayne Rooney and Darren Fletcher as they helped secure a Capital One Cup victory over Newcastle. 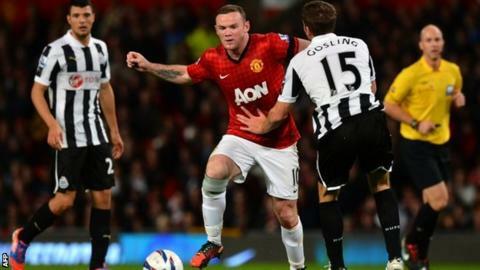 Anderson and Tom Cleverley scored in the 2-1 win as Rooney returned following a thigh injury last month. It was also Fletcher's first start in 10 months after a bowel condition. "Darren Fletcher has had a great 90 minutes and Wayne Rooney had a terrific performance, he tired understandably, but I'm really pleased," said Ferguson. "We played really good football and interchanged throughout the match. Okay, we didn't have the width we normally have but that was the plan: to play with a tight midfield and they have all done well." Rooney, who showed some neat passing and completed 76 minutes before being replaced by Nick Powell, said the workout was a step in the right direction. The performance was only his second start of the season after playing against Everton in Manchester United's opening Premier League game before being dropped to the bench against Fulham. The 26-year-old said: "It's been just over four weeks since I last played and I'm delighted to be back out on the pitch. "I feel good, obviously it's always difficult in your first game back after a few weeks but it's great to get the minutes under my belt and hopefully that can benefit me." Fletcher, who played the full 90 minutes, added: "It is great to be back." "I have had a few reserve games and a run-out in the Champions League last week but it is good to be back, especially at Old Trafford, and in a winning team as well." Ferguson, whose side now face Chelsea in the fourth round, was also content with the performance of an inexperienced defence which had just two previous senior appearances between them. Centre-back Scott Wooton and right-back Marnick Vermijl both made their debuts and were joined by Michael Keane and Alex Buttner in an inexperienced Manchester United defence. "Tonight we won with a good bit of style, they've enjoyed it and the players did well," Ferguson added. "We knew it was going to be a hard game and Newcastle played a strong team, but I think our young players handled that quite well." Cleverley's goal was his first for United and afterwards Rooney revealed the England midfielder, 23, had received a ticking-off from Ferguson at the break after missing a great first-half chance. "The manager wasn't too pleased with Tom because of that miss in the first half," said Rooney. "But it was a nice goal by him and a great strike by Anderson. I am delighted for the two of them, especially Tom because it was his first one."